AP’s own reporting debunks unprecedented walrus claims: The AP reported on 40,000 walruses in a haulout just 7 years ago in a single location. The AP article titled, “35,000 walrus come ashore in northwest Alaska”, claims “the gathering of walrus on shore is a phenomenon that has accompanied the loss of summer sea ice as the climate has warmed.” The AP even includes the environmental group World Wildlife Fund, to ramp up climate hype. “It’s another remarkable sign of the dramatic environmental conditions changing as the result of sea ice loss,” said Margaret Williams, managing director of the group’s Arctic program, by phone from Washington, D.C. The media and green groups are implying that walrus hanging out by the tens of thousands is a new phenomenon and due to melting Arctic ice. But dating back to at least the 1604, there have been reports of large walrus gatherings or haulouts. Even the green activists group, the WWF, admits walrus ‘hangouts’ of tens of thousands are not unprecedented. Are 35,000 walruses gathering in “haulouts” on the shoreline with many be stampeded to death really that unusual? The answer is No! As climate blogger Tom Nelson noted in a December 28 2007 analysis: “Are you saying that that spot *was* used as a haulout in earlier years?” Nelson wrote. Walrus stampede deaths drop dramatically from 3000 to 50? Are walrus stampede deaths declining in recent years? It is difficult to say based on reports, but a high of 3000 deaths in 2007 (for a whole season) to a low of 50 deaths in 2014 for a single location, but it does not appear to be an alarming trend. Why does the AP fail to put any historical perspective on their climate scare stories, especially when the AP’s own reporting from 7 years ago calls into question their claims? In addition, a 2007 WWF post inadvertently noted that the carcasses of stampeded walruses may actually be a great benefit to polar bears. The stampeded remains of 100 walruses fed up to 185 polar bears! According to the Alaskan government, walrus haulouts are not unusual and have long been recognized and islands have been set aside for such gatherings. The Alaskan government report noted that numbers of 14,000 walrus haulouts in a single day were not unusual. Google currently shows about 14,000 hits for “walruses stampedes”. The giant, tusked mammals typically clamber onto the sea ice to rest, or haul themselves onto land for just a few weeks at a time. Ok, so it’s not unusual for them to haul up on land. Google shows a lot of pictures of them on land. 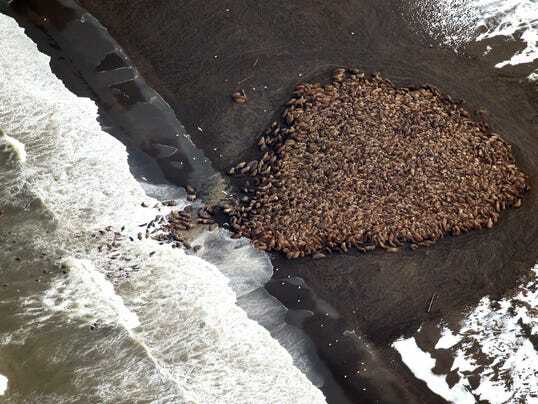 As a result, walruses came ashore earlier and stayed longer, congregating in extremely high numbers, with herds as big as 40,000 at Point Shmidt, a spot that had not been used by walruses as a “haulout” for a century, scientists said. Are you saying that that spot *was* used as a haulout in earlier years? Walruses are vulnerable to stampedes when they gather in such large numbers. The appearance of a polar bear, a hunter or a low-flying airplane can send them rushing to the water. Are stampedes ever caused by the appearance of researchers or low-flying research planes? Sure enough, scientists received reports of hundreds and hundreds of walruses dead of internal injuries suffered in stampedes. Many of the youngest and weakest animals, mostly calves born in the spring, were crushed. Biologist Anatoly Kochnev of Russia’s Pacific Institute of Fisheries and Oceanography estimated 3,000 to 4,000 walruses out of population of perhaps 200,000 died, or two or three times the usual number on shoreline haulouts. Were anecdotal reports of “hundreds and hundreds” used to come up with the estimate of 3,000 to 4,000? How much actual counting was done? What’s the baseline number of annual stampede deaths? Is anyone checking that any animals found dead were killed in stampedes, rather than dying from some other cause? No large-scale walrus die-offs were seen in Alaska during the same period, apparently because the animals congregated in smaller groups on the American side of the Bering Strait, with the biggest known herd at about 2,500. So when a walrus herd of 2,500 is panicked, stampede deaths are not a big deal, but when the herd reaches tens of thousands, we can expect lots of stampede deaths? As the Pacific walrus population grew, annual subsistence catches by indigenous Arctic peoples ranged from about 3,000 to 16,000 walruses per year until about 1990, and then decreased to an average of 5,789 animals per year from 1996 to 2000. Pacific walrus meat has been used for the past 40 years to feed foxes which are kept on government – subsidised fur farms in Chukotka. One estimate made by natives was of an annual kill of 10,000 – 12,000 walruses per year, but this may have been overstated. Recent investigations have found that much of the meat is left to waste and that there are no markets for the resultant fox furs. Fox farming operations in Chukotka are currently in decline due to economic recession. Local unemployment caused by the general economic situation and the closure of the farms has however led to a recent increase in illegal head-hunting. Last fall some 20,000-30,000 animals were piled up there. No one has actually counted them all, but the Vankarem residents are certain the number is growing. In early winter, when the ice is re-forming and walruses leave the beach, up to 100 carcasses remain behind. These blubbery animals offer a perfect meal for wandering and hungry polar bears. As soon as the walruses departed, the polar bear patrol spent several days working to collect the remains of walruses killed in the stampedes. Using a tractor, they carted the carcasses six miles west of the village, anticipating that the bears would come from the west in the fall. In the end, they scattered some 80 walruses around selected sites — and then they waited. In mid-November, a truck driver alerted the patrol to bear tracks on the beach. The wave had begun. For the next three weeks, bears making their way along the coast stopped to graze on the carcasses at this so-called “feeding point” instead of proceeding to the village. At one time alone, Sergey and his team counted 96 bears feeding on the walrus. In total they estimated that 185 bears had been circulating with a six mile radius around the village. My comments: Eighty-100 dead walruses out of 20,000-30,000 hauled out on land seems quite low, if Kochnev’s estimate of 3,000-4,000 total stampede deaths is correct (remember, his estimate is based on a population of maybe 200,000, many of which are not hauled out in huge herds). Also, if polar bear numbers are so threatened by global warming, what are 185 of them doing within six miles of the village? Polar bears hunt walruses by rushing at beached aggregations and consuming those individuals that are crushed or wounded in the sudden mass exodus, typically younger or infirm animals. Some video of polar bears successfully hunting walruses is here and here. I don’t see any ice in that first hunting scene.